An acne papule is type of inflamed blemish. It looks like a red bump on the skin. Papules form when there is a high break in the follicle wall. An acne papule often turns into a pustule. Acne papules are also known as pimples or zits. Acne papules develop when the hair follicle, or what we more commonly call the pore, becomes clogged with skin cells and excess oil. This plug or blockage is called a comedo. All acne papules begin as a comedo. The extra oil in the comedo plug oil makes good "food' for a specific resident of the skin, the propioni acnes bacteria. These bacteria happily multiply. All this extra material building up in the pore puts pressure on the follicle. With enough pressure, the follicle wall ruptures. The material spills out into the surrounding skin, causing irritation. The skin becomes red, inflamed, and sore. This red bump is called a papule. Sometimes the papule progresses into an acne pustule when pus forms a white head on the blemish. Got a Large, Inflamed, Painful Blemish? Acne papules aren't the only red, inflamed bump you can get on the skin. Papules can be small or large. But if you have a blemish that is especially red, swollen, and painful, it may not be a papule at all. Instead, you might have an acne nodule. Nodules are similar to papules — they both form because of a blockage of the hair follicle. 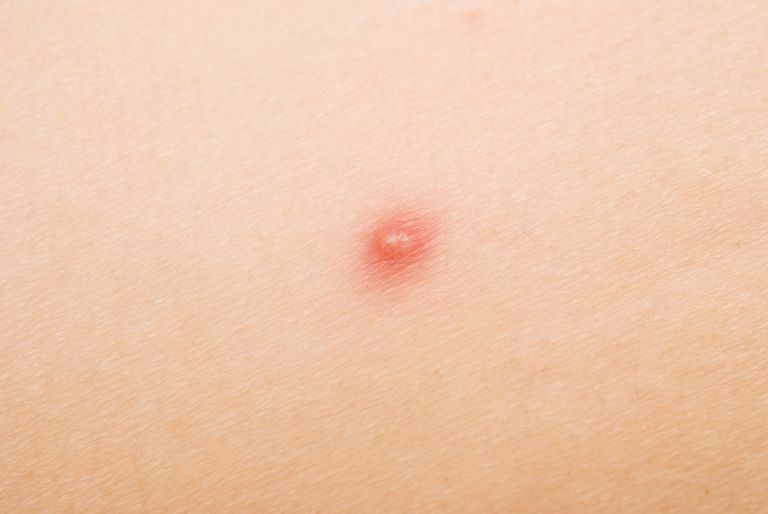 But nodules happen deeper in the skin and are a more serious form of a blemish than a papule. They happen when there is a deep break in the follicle wall and the infected material spills into the dermis. Acne nodules take a lot longer to heal than papules, too. Even the largest papules heal within just a few weeks. Nodules can sometimes take months to heal. There's a higher chance of developing scarring with nodules. Nodular acne should always be treated by a dermatologist. You have plenty of options to treat acne papules. The treatment that is best for you depends on how severe your blemishes are. If you get just a few pimples here and there, but your skin is relatively clear most of the time, acne spot treatments may be all that you need. Look for one with salicylic acid, benzoyl peroxide, or sulfur for the best results. Dab on individual pimples to help them heal faster. Spot treatments only heal pimples after they're already on the skin. So, if you are looking for long-term clearing of the skin, you'll need a different type of treatment. Over-the-counter acne products can be helpful for mild breakouts. Again, look for products that contain benzoyl peroxide, salicylic acid, or sulfur. For moderate to severe breakouts, you'll need a prescription acne medication instead. A dermatologist can design a treatment plan that will clear the acne papules that you have now, plus keep new blemishes from forming in the future.